Douglas Brooks is an America boatbuilder and scholar of boatbuilding, specializing in traditional Japanese small craft. He has apprenticed himself several times to Japanese builders to learn techniques associated with various types, such as the shimaihagi in the foreground of the photo above, and the tub boat, or taraibune, below. He does lovely work, and a visit to his website is most worthwhile, both for the lovely pictures of these fascinating boat types and for his descriptions of his building experiences. (He also maintains the site in Japanese, here.) 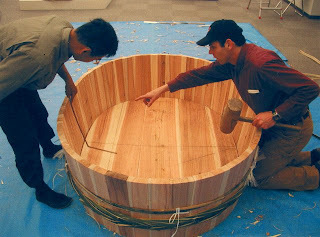 He builds boats for museum exhibits, and is the author of The Tub Boats of Sado Island; A Japanese Craftsman's Methods, which is also available through his website. An article by Douglas on tub boats is available on the Amateur Boat Building site. I had the opportunity to meet Lance Lee twice this month, and to see the Indonesian fishing boat Lansing Madura, the building of which came about as an offshoot of Lance's Tremolino! project. Lance had the boat on display at the Maine Boats Homes & Harbors show in Rockland, Maine, and at a lecture at the new Sail, Power & Steam Museum, which is busy a-birthing, also in Rockland. Lance has been at the forefront of the movement to merge boats with experiential education for decades. The founder the The Apprenticeshop and Atlantic Challenge, he is now involved in something he calls "The Tremolino! Project." This is actually a related series of projects that Lance chooses not to turn into a formal organization. Drawing inspiration from educator Kurt Hahn and author Joseph Conrad, Lance uses boatbuilding and seamanship as vehicles to teach self-reliance and internationalism, and to crusade against youth's propensity to prefer virtual reality over the real stuff. Lansing Madura is a Java Sea fishing gole'an. She was built in Indonesia over the course of about six weeks by one of the few remaining native builders of this type of craft and members of his community, assisted and inspired by one of Lance's proteges, Brian McClellan, also associated with Atlantic Challenge. 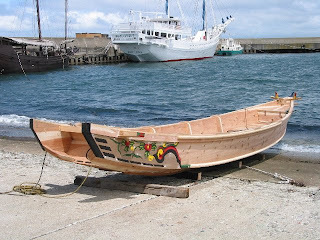 The boat was built entirely with hand tools, with the objective of helping to revive the use of traditional boats to rebuild the local fishing fleets. She is built entirely of teak in a shell construction method -- i.e., from the outside in. Virtually no metal fastenings were used -- she is pegged together. The most modern technology involved in her construction was the use of a come-along to pull the plank edges tight against each other. She uses a crab-claw rig with a good sized mainmast and a very small foremast -- I suppose you might call her a crab claw schooner? A year ago, a 32-year-old marine and sports promoter announced plans to sail a sabani from his home in Okinawa, Japan, to Beijing for the Olympics. Takuji Araki planned to have a crew of eight, including children (!) and to use no modern navigation equipment. (reference) I haven't heard anything about him or his project since -- did he do it? 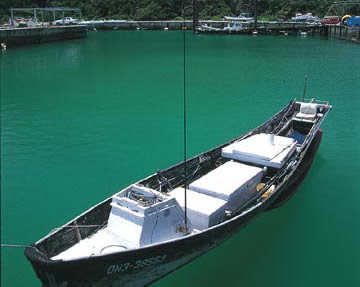 The sabani is a traditional fishing boat native to the Japanese island of Okinawa. Dating back hundreds of years, the tradition of sabani building and use is still alive, thanks to two developments: newfound interest in racing them, and the adaptation of the form to accommodate an engine. The bottom consists of a single, heavy plank, somewhat hollowed, dugout-fashion, and if a plank of sufficient length is unavailable, two or three sections may be joined end to end. The sides may consist of a single wide plank or two or three narrower ones. These are built up without metal fastenings, using a kind of keyed or dovetailed edge fastening similar to the method employed by the ancient Egyptians. Some appear to be lightly built, and others quite robust. They have the reputation of being fine sea boats. 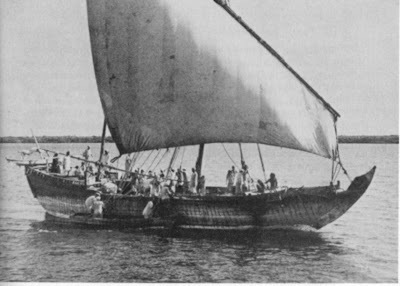 Sabani are traditionally paddled or sailed with a fully battened lugsail. They are raced under paddle in a popular annual festival at Itoman, Okinawa, and in Hilo, Hawaii, which picked up the practice when it became a "sister city" to the city of Nago in Okinawa. A racing sabani carries single paddlers on the first and sixth thwarts, and two paddlers each on the second, third, fourth, and fifth. There is also a helmsman, presumably in the rear, although I see a reference to the helmsman in the bow (!) and a "standard bearer" in the stern on a seventh thwart. Perhaps the "helmsman" is really a coxswain only calling stroke? Racing sabani are sometimes referred to as "dragon boats," although they are quite different from Chinese dragon boats. 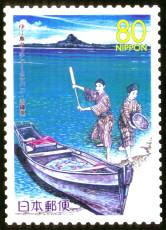 The postage stamp shows a traditional sabani, with Iejima or Ie island, off the northwest coast of Okinawa, in the background. Image from here. The motorized sabani image from here. The plan view from here. 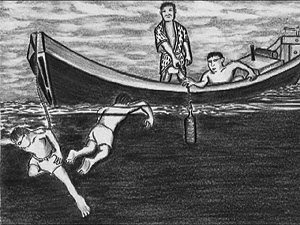 Woodcut of sabani fishermen from here. A few months ago I described the Dover Bronze Age Boat here. 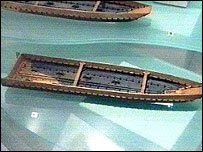 Discovered in 1992, it is the most elaborate boat of its age (1500 BC) yet to be discovered in Europe. Sitting at the cusp between dugout technology and planked construction, the vessel was constructed of four lengthwise sections of oak logs, elaborately hollowed to fit together in the shape of a boat and then lashed together with small split branches (withies) of yew. Terrible technology, since there was little structure to prevent the log sections from working against one another, but really impressive woodworking and clearly on the right road toward the right technology. Now some of the same archaeologists who have been involved with the boat since its discovery have a new project to build a full-size (10 meter) replica and test it on a voyage from Folkestone, England, to Wissant, France in 2010. Read the full article in on the Stone Pages website, here. It is assumed that the original boat was paddled, not rowed or sailed. (The boat probably had one more set of strakes above those recovered in the excavation, and it is possible that evidence for some provisions for rowing might have been lost, but lacking those upper strakes, and lacking any evidence for the use of oars in England at the time, the use of paddles must be assumed.) The replica, therefore, will be crewed by volunteers from the British Dragon Boat Association, who have some experience paddling large open craft -- although to the best of my knowledge, dragon boat racing is always done in protected waters and not on anything as boisterous as the English Channel. Should be interesting. Outrigger Sailing Canoes -- a blog by Gary Dierking, New Zealand-based American multihull builder, designer, and author of Building Outrigger Sailing Canoes. ProaFile - a blog by proa designer Michael Schacht, a Seattle-based proa designer. Both have lots of info. on both modern and traditional proas and occasionally on other types of multihulls. I know Gary Dierking and edited his book, and think it's very good.